The love triangle begins! Frankly, I would have preferred if it hadn’t given how Inho had just begun rebuilding his life but here we go. Inho and Seol have been pretty comfortable with each other right from the start so it’s interesting to see him suddenly feeling uncomfortable around her and making excuses for red cheeks and a rapid heartbeat. You poor thing. It’s nice to see a guy with integrity though. Seol’s clearly feeling down and her relationship with Yoo Jung is a bit rocky, if not on the rocks at the moment, and there’s no better point for Inho to jump in. Most Kdrama leads, or even Yoo Jung himself (were the shoe on the other foot), probably would go for it at this point. Yet, Inho, despite not being a fan of Yoo Jung, stays put. Thank you dramaland. I get why he lied to Inha though 1) she would let him hear the end of it, even if he said they were just friends 2) I wonder if Inha even understands what friendship means. She’s more of a ‘give and take’ person. Allow me a moment to mourn Inho not even being in the running for Seol’s heart. 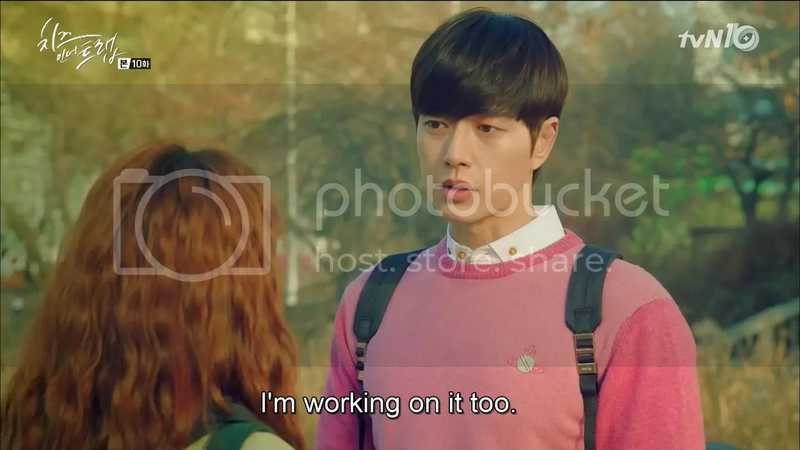 I fall so hard for characters like him because they wear their heart on their sleeve and live life (even if not perfectly) but with exuberance and some strange form of joy (whiney, mopey chaebols with first-world problems like whoever Lee Minho & Kim Woobin were in the Heirs do not belong in this category. Shin Segi does ❤). Inho’s madcap as hell and I can’t help but feel Seol and her friends’ consternation as he keeps ruining their video (but they could just the earlier part?) but I love how much he cares about her safety. I love how Seol’s motivating him to reach for more in life. He may not get the girl (in fact I’m 100% sure he won’t) but their friendship’s transformed his life, and I think that’s just as profound in its own way. Onto Seol, who’s made some big steps in the last couple episodes. Her confrontation of Minsoo was satisfactory as hell, and I really don’t think it was some elaborate orchestration on Jung’s part. If I’m not mistake, Jun actually texts Jung first, saying that he’ll be on campus later. All Jung did was provoke Minsoo a teensy bit, direct her to the website, and bring up Jun’s photo on her phone, Minsoo dug her own grave with the rest. Seol took matters into her own hands as well. If she hadn’t decided to confront Minsoo head on, then Jun wouldn’t have noticed a thing and his arrival would have gone unnoticed by Dajung and the others. Seol owned her moment and I think it’s fair to give her the credit. As much as I feel for Minsoo, I’m glad she’s done. Identity is such a big part of one’s teens, especially during one’s college years where everyone’s finding their feet in the ‘adult’ world after the high school bubble pops, that I completely get why Seol was so upset at what Minsoo was doing, and how she was being turned from victim into aggressor by everyone else. That Seol wonders if she should have seen it from the other side only shows what an empathetic person she is and how she always tries to learn from every experience in life. I appreciate her reminding Yoo Jung that she can’t be the only one walking forward in this relationship. He needs to do just as much understanding of what he’s done wrong as she does to try and understand him. 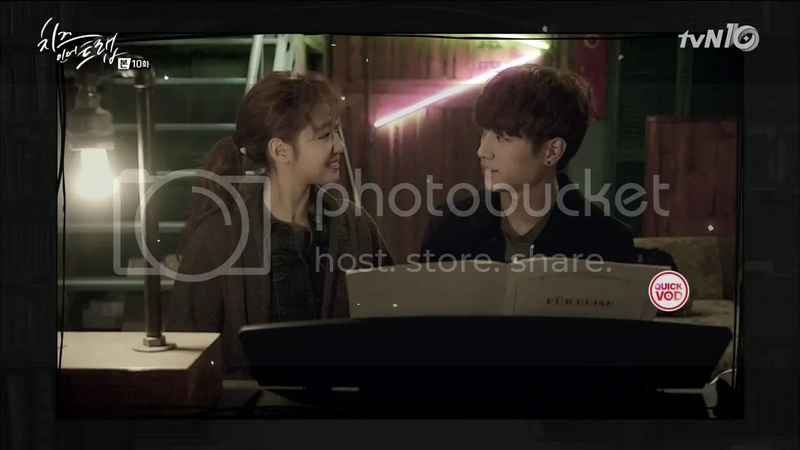 A relationship works two-ways and Yoo Jung is very aware of that but takes it to mean something completely different. 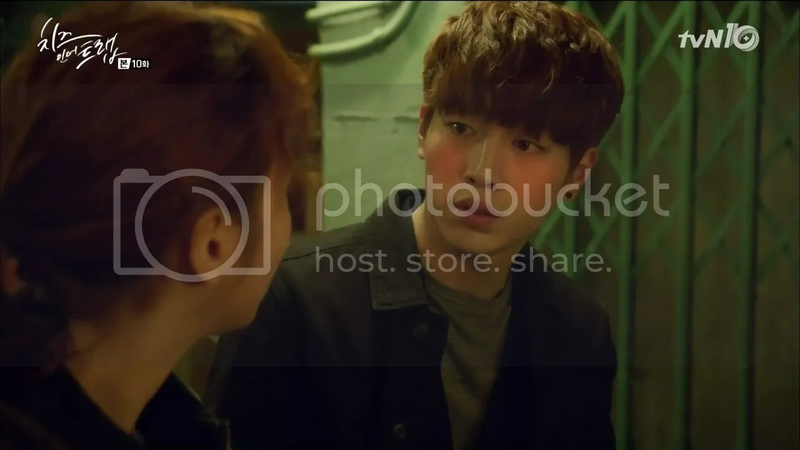 He runs around behind the scenes trying to micromanage threats in Seol’s life like he does in his in return for her affection.Him asing Euntaek to send him the videos is proof of that and it’s sad that he feels the need to pay her back this way. In a way it puts him close to Inha with regards to their understanding of relationships as both are very much ‘give and take’ people, though Yoo Jung gives a great deal of unreserved affection as well, making him somewhere between Seol and Inha on the relationship scale. We rarely see much of Yoo Jung’s relationship with his father, and while I thought they were on great terms, it’s become clearer and clearer that he’s under a lot of pressure. You can’t really consider it a first-world problem when he’s handling it so well though. Jung isn’t running off and rebelling in a classic asshat rich-kid manner but doing his very best to meet those expectations. Yet this places even more pressure on him, because one small ‘wrong’ move on his part makes him look tenfold worse than it would any normal person. 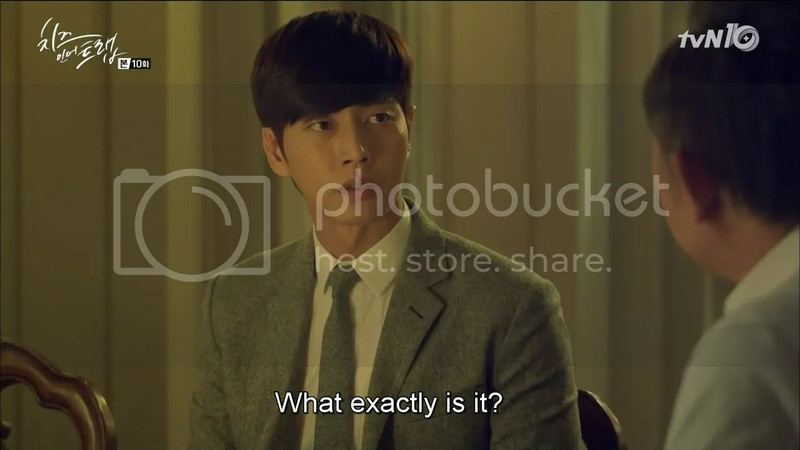 Perhaps it’s because I last saw Park Haejin as a psychopath or because I’m so used to seeing geniuses in dramas but it’s so easy to mistake Yoo Jung as one when he isn’t. He’s of above average intelligence, and highly self-control but saddled with just as many problems and questions and worries as everyone else. He just never shows it. The man behind the enigma is finally coming out in full force, and I didn’t even feel a thing when he neared Minsoo and faked that he thought it was Seol with that creepy ost playing. All I saw was a man who cared about Seol, was worried that he was losing her, and worried about how she was feeling because of Minsoo. It’s no different from what Bora would do. Yoo Jung’s no bad guy. He’s just a teensy bit strange, and hopefully he’ll learn that others won’t mind that. And speaking of bad guys we’d a great deal of villans versus villans or perhaps it was a rendition of ‘Everybody hates Sangcheol’. The guy got told off by Inha and Young Gon. You’ve got to be really annoying for that to happen. I did enjoy seeing someone put Sangcheol in his place, and good on Inha on being the one to properly cow him. Sangcheol’s right about some people just having more opportunities but all the rich kids he referenced, Yoo Jung and Jaewook, were incredibly hard workers. In a reverse of regular stereotypes, he’s the lazy bum. Ouch. Though Young Gon’s being hypocritical as hell here and I seriously want him to get his. Inha’s idiocy’s also driving me insane. I thought she was smarter than to send him that photo. Ah well, the preview shows our couple racing to a teary embrace so I’m sure it’ll work out. Besides, Inha did have her moments in this episode. There was something about her knowing the work of art in Jaewook’s textbook that came off as extremely sad. It makes me want more purpose for Inha than manipulating trash like Young Gon. But it is especially satisfying to watch her go all out on him and her reaction to the photo of his ‘abs’ was hilarious. It’s times like this when I can see why Inho has such a love-hate relationship with her. She can be utterly awful, but she’s gold when she’s on your side. The problem is that she only does it for money as opposing to caring about the person in question. Hopefully we’ll get to watch her go beyond that? On the other hand, here’s to the best friends a girl could have. This is what friendships are made of. You can’t go without them when dealing with people like Young Gon and Dajung. Though I suppose this would work as well. Here’s to the next Cheese-less week! May all of us make it through! You have said it all…. when Young Gun told Sang chul to get his life together, i laughed so hard. If Young gun can spit out a good advice, sang chul really is messed up. I get his complain, but he is just using that as an excuse to be somebody. Like he is afraid to venture out on his own because he is fearful of failure….funny thing though, the people he surrounds himself with are willing to help him if he does his part and doesnt take shortcuts. Too bad he doesnt realize that. Young gon is mentally sick, but he does read people well. He is good at judging characters, if he wasn’t a lovestruck stalker, dare i say, he is more dangerouns that Jung? His plans to manipulate come into frutition, but at some point, it will unravel itself. Just like Jung who is in the dilemma with Seol. 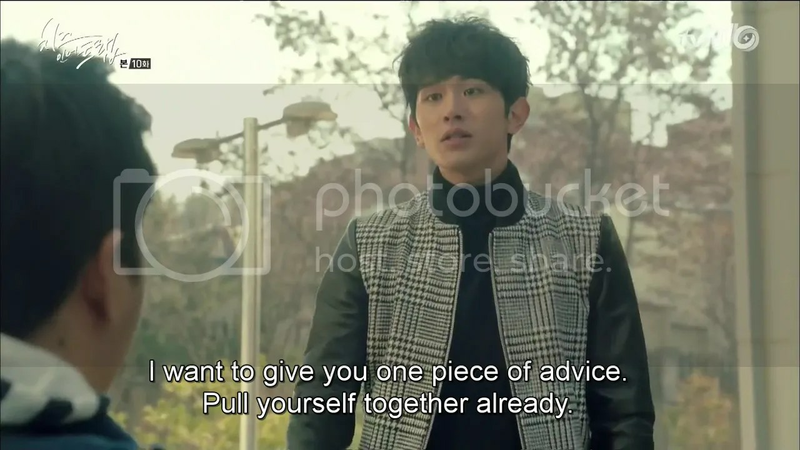 As for Inha….i kinda didn’t like how his like for Seol begins to happen when he is trying to get his life together. It felt he was equating his like for her due to her constant support and encouragement. However, it did make sense though, Jung isn’t his buddy like in the past, so there is no reason for the attraction to grow. If jung was his friend i am sure those feelings would be shut down because it will be not cool trying to take you friend’s girl. But, Seol is his one supporter and constant reminder that there is more to life than not caring. Shoot…i will crush on someone who sees potential in me. Seol is growing and i love that even though she’s like Jung is some sense, she empathzies and see the other side of the coin.